What did you eat for breakfast today? What did you feed your kids? Are you in a breakfast rut, or worse yet, not eating anything at all? Here are some ideas for breakfast to get our kids’ bodies, as well as our own, fueled and ready to go in the morning. Sometimes we need some new ideas to spice things up a bit. Oatmeal is a great choice for breakfast. Your children will love the comforting flavors of this staple. Skip the heavily processed oatmeal that comes in individual portions. Cooking oatmeal from scratch is quick and simple. Steel cut oatmeal is the healthiest choice because it’s the least processed. However, it takes the longest cooking time. Soak the oats overnight to make them cook up quickly. (or you can quickly make them in an Instant Pot) You can also make a huge batch of oatmeal on the weekend and portion it out on the weekdays. If it’s too bland for you try adding in a little cinnamon, raisins, chopped nuts, or cranberries. Eggs are an amazing breakfast for children. Filling them up on protein will keep them full all morning. Scrambled eggs are a fast and tasty way to get breakfast on the table. If you’re really pressed for time, consider boiling eggs the night before. A hard boiled egg is “fast food” because they can eat it running out of the door. A little sprinkle of salt and pepper is all it takes to flavor this healthy food. Serve it with a slice of toast for a full meal. Muffins are generally very unhealthy. A typical muffin you buy at the store could be over 1000 calories! The good thing is they’re easy to make yourself. Look for an oat bran recipe, and replace the oil that’s called for with apple sauce. It will add amazing moisture while keeping the muffin lower calorie. Add in your kids’ favorite fruit and toppings, like raspberries and pecans. Breakfast muffins are a smart choice for busy mornings as they can just grab them on their way to school. If your children don’t like eating breakfast, try a breakfast drink instead. Many kids feel nauseated in the morning as their bodies are not designed to wake up so early and get to school. Breakfast shakes are an amazing way for them to get the nutrition and energy they need for the long day ahead. Blend together frozen fruit with yogurt, milk, or juice. You can even sneak in a vegetable or two without them being able to taste it (spinach and kale work great here)! Yogurt is a great way for kids to get ample protein early in the day. Greek yogurt is thick and full of protein and calcium. It’s a better choice than some of the other types which may have very low protein amounts and can be loaded with sugar. Sweeten the yogurt up with a little honey and top with fresh fruit and granola. Be careful when buying or making granola- it is easy for granola to have a high fat content as it’s baked with butter or oil. Look for low fat varieties and always check the nutrition label. Another option for a soft breakfast is cottage cheese with fruit. Your kids will love the sweet flavor while getting ample protein from the cheese. Cottage cheese can be quite high in calories and sodium, so check the label on your favorite brands. Cottage cheese is also a great topping for toast or eggs. You can easily make a fruit salad on the weekend, and serve portions of it through the week for breakfast. It will only taste better as the days go by. Don’t keep it past a full week though, or else your fruit could start going bad. If your children dislike peanut butter and banana sandwiches, try putting it in a wrap. 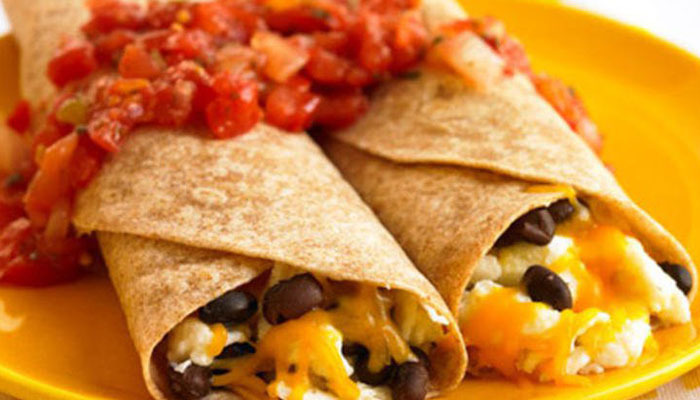 Wraps are fun to eat and make a great change from the ordinary breakfast. Look for whole wheat wrap varieties for higher fiber and protein content. You can make a variety of different wraps based on your kids’ preferences. Tuck eggs with salsa for a Mexican inspired breakfast wrap. Use sliced up apples with cheese and yogurt for a sweet touch. English muffins are a classic breakfast staple, but we can always make them healthier. Whole wheat English muffins are just as delicious as the white varieties, but are packed with more fiber and nutrients. Some manufacturers offer “white” whole wheat products that look just like your kids favorite brands. Top your English muffin with sugar free jam and natural nut butters. You’ll be saving your children from extra sugar and setting them up for a healthy day. An omelet may seem like an adult choice for your children, but it’s a great interactive opportunity. If you have some extra minutes in the morning, let your kids help decide what their omelet will be filled with. Set up child friendly toppings, like pepperoni slices, mild cheese, and sneak in some grilled vegetables. Omelet breakfasts are quite filling and are lower in calories while being high in protein. Frittatas are also a fun choice. This fast food favorite can be pretty healthy from a restaurant. However, making it at home is a good option to save money and amp up the nutrition. Start with a whole wheat English muffin and top it with a fried egg and a slice of cheese. This is a perfect breakfast for an older child for when they are late for school. They can eat it on the go without having to sit at a table. Using a whole wheat English muffin will add more fiber and nutrients to the meal.